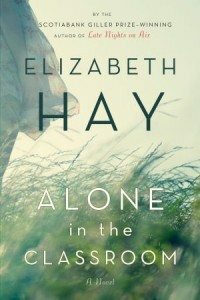 This review of Elizabeth Hay’s new novel, Alone in the Classroom, appeared in the June issue of Q&Q. For many, the title of Elizabeth Hay’s new novel will resurrect unpleasant memories. Who among us did not suffer cruel teasing, bullying, or punishment in the classroom for sins such as failing to master math, being fat, or simply wearing the wrong clothes? We carry those scars with us into adulthood. Some of us learn to hide the youthful injuries to our psyches, while others remain overwhelmed. You don’t get over it, failure in elementary school, says Michael, who felt ever so alone in the classroom as a result of his dyslexia, which rendered him unable to spell. Other sorrows you might get over, but not them. Michael is just one of the meticulously drawn, immensely complex characters who populate Hay’s first novel since 2007’s Scotiabank Giller Prize“winning Late Nights on Air.